Don’t know where to begin for your bachelorette party? There are so many things that can go wrong when a bride is prepping for her big day. Will the dress fit? What if the food is awful? Will the groom show up? The last thing on her mind is whether or not her bachelorette party will be a success. This is where the bridal party comes in and the maid of honor can (potentially) save the day. Host a bachelorette party with Hollywood Blvd Crawl and ease any fears the bride may be experiencing by heading out to the entertainment capital of the world - Hollywood, CA. Bachelorette parties are one of most popular options to club crawl the city as you explore A-list Hollywood clubs. 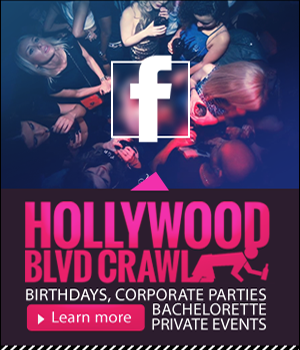 Hollywood Blvd Crawl invites your bachelorette party to join the ultimate Hollywood Club Crawl on the wildest girl's night out party tour of the best clubs in LA. Our professional party coordinators are all about creating special moments for you and your guests. Experience the nightlife in Hollywood and invite all your guests to a smashing event. We will guarantee that you will definitely not forget this pre-wedding night. Before a bride recites her vows and tosses the bouquet, consider joining the ultimate Hollywood club crawl. Get access to L.A.'s top Hollywood nightclubs with complete velvet rope VIP on the Hollywood Blvd Crawl with our nightlife experts as the last fling before the ring! We offer amazing nightlife deals and clubbing discounts on bachelorette party packages. Bachelorette party crawls are the perfect option for an entertaining night for you to share with your close friends and family. We guarantee an unforgettable memory before you tie the knot. The Bachelorette party is one of the most memorable nights in a woman’s life, and our staff will make sure that your group of girls have a blast. If you are the Maid of Honor in your best friend’s wedding and you aren’t sure where to begin planning or what to do, our staff is here to help. Our Los Angeles nightlife event planners will carefully orchestrate options for a fun night out on the town, bachelorette party packages for you and your friends. We will make sure that you get “Star Treatment” and that the night of the event unfolds seamlessly as you dreamed of. We carefully listen to your ideas, needs, and budget that you have outlined. Then, our staff will customize different VIP clubbing party packages that you can choose from. Purchasing these clubbing packages mean customers have access to an affordable all-inclusive Hollywood nightlife experience. It is our goal to make sure that you get exactly what you want and that your bride-to-be has the best time of her life when experiencing bachelorette party crawls. The Best Bachelorette Party happens on the Hollywood Blvd Crawl in Los Angeles and Hollywood areas of Southern California. Have a Ladies Night Out in LA to Remember at Playhouse Hollywood, Supperclub LA and more with: No line, no cover, no hassle! Your bachelorette party can club crawl Hollywood top nightclubs or ask us about our custom tour bachelorette parties. Your friendly tour guide will take you to best LA clubs, ensuring your bachelorette party has an amazing experience. Contact us today and make sure to ask about our Bachelorette Bottle Service Specials. Los Angeles is the nightlife entertainment capital of fun. So what’s a better place to hold your bachelorette party? All your friends will clamor for an invitation. Enjoy a liver whipping Hollywood Club Crawl of top LA nightclubs and party nightlife destinations in Los Angeles. Let Hollywood Blvd Crawl plan your bachelorette party! Head to Hollywood’s top Los Angeles nightclubs with FREE drinks, drink specials, and NO COVER charge at the best clubs in LA! We can even provide you with your own VIP HOST and help customize your evening! We want this to be the most memorable bachelorette party ever.